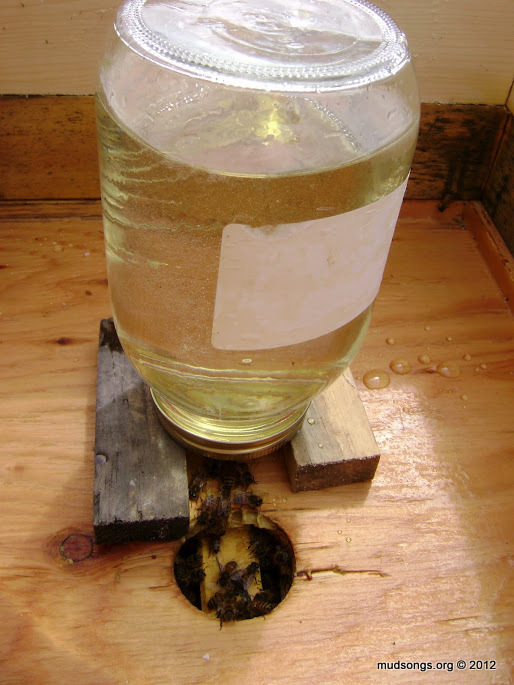 This entry was posted in Feeding, Jar Feeder, Month of April, Sugar Syrup, Year 2012. Bookmark the permalink. I did an inpection of the top box only and since there is still so much capped honey in the hive I decided not to put the bottle feeders on so they can eat through some honey and free up some frames so I can remove some of those frames. By the end of April if they do not have some frame all empty I plan to take out the partially filled honey frames and let the bees remove it externally so I can I can get those empty frames. Also I am amazed how far along the bees are and how much pollen they has stored up. I’d say that if you combined it over all the frames in a colony there is easily 2 – 3 frames of pollen present in some colonies. Much further ahead then last year. take a look at a quail feeder. it has a shallow lip all around and lots of bees can feed at once. they hold gallon of sugar syrup and don’t seem to leak hardly at all. bees drowning is not a problem either. they are available at most farm supply stores. I don’t know where they’re getting it, but our bees are bringing in a steady supply of pollen too. We have rain for the next two days, but I hope I get a chance to see some of the those frames over the weekend. They must be packed with pollen. I only have jar feeders on two of our four hives, and by the looks of it, the bees are taking down the syrup. The two hives with the hive top feeders (HTFs), however, didn’t show any interest in the syrup from the feeders. A small cluster of bees moved into each feeder, but they didn’t go for the syrup. Poking around like I shouldn’t be, unable to leave well enough alone, I decided to remove the feeder from one of the hives this afternoon to see if I could figure out why the bees weren’t going for the syrup. The only thing I noticed was some condensation underneath the feeders. It’s possible the syrup is getting too cold at night for them, and they just shied away from anything cold. I didn’t like seeing condensation in the hive either. So I removed the HTFs from both hives. I’ve decided not to bother with HTFs until after the first frost for now on, or until I know the night time temperatures aren’t hovering around zero. If I really need to feed the bees this early in the spring, I might just stick with jar feeders placed away from the inner cover hole. I took the time to look more closely at the frames in the top box of each hive. I’d say 7 or 8 frames of each box are loaded with bees. I don’t think they’re running low on honey either, though it was difficult to see with all the bees in the way. I suppose I could lift the hives to see if they’re light, but I think they’re probably fine. I’d like to get a hive scale for next year so I don’t have to bother guessing about how much honey is in the hive. You’re the only other beekeeper that I’ve seen feed like this. This is how I feed. Only I push my jars to the side of the lid and keep 2 or 3 jars per hive. My other Bkeeps friends always ask what I’ve got going on with the extra hive bodies. They think I’m supering early. Till I show them. I feed till the bees don’t take it anymore. Or it’s time to super. IF the bees end up with full frames of honey still in the hive right before I super, I’m gonna pull a few and use those for splits. My bees are pulling in nectar already, there are honey flows here in Montana now (this is early, normally they start in mid-may). But I like to feed to be sure the girls have nourishment. My breed does some rapid spring build-up and the risk in that is starvation, so I like to make sure I feed. Good post. I’ll post some picts of my hive feeder on my site if you wanna get a gander. Oh and PS, thanks for the advice on the camera. I actually have a powershot sx120 IS. I just always tried to use my big commercial cameras not even thinking about the point and shot (its the family camera). But its great for shooting the bees, so thanks!! Thanks, Don. I’ll check your site now. I like the multiple jar idea. The biggest jar I use in a 4-litre pickle jar. I’d love to get my hands on more of those. I was just looking over my records from last year, and I noticed that my bees ignored the hive top feeders but took plenty of syrup from the jar feeders — exactly what happened this year too. Perhaps the bees don’t like leaving the brood area too long to access syrup in the hive top feeders, at least when it’s still cold at night. Jar feeders are my favourite because they’re the easiest to refill and changing them up doesn’t disturb the bees. For building up nucs, I like frame feeders (with bee ladders). Out bees take syrup from those faster than anything. Hey Charlie — You said, “have heard that if you put your entrance like you show…” I’m not sure what you mean by that. Are you referring to the upper entrance? I’ve seen bees build inside an empty super with no frames (or inside a feeder box) and make a mess of everything (not in any of my hives, thankfully), but from what I understand, it usually happens with packaged bees that haven’t built any comb yet. Bees that have comb available will work the comb before they go anywhere else. If I put the jar feeder directly above the top bars with no inner cover in place, the bees would have no problem eventually building up into the empty space. I’ve seen this happen with my bees. 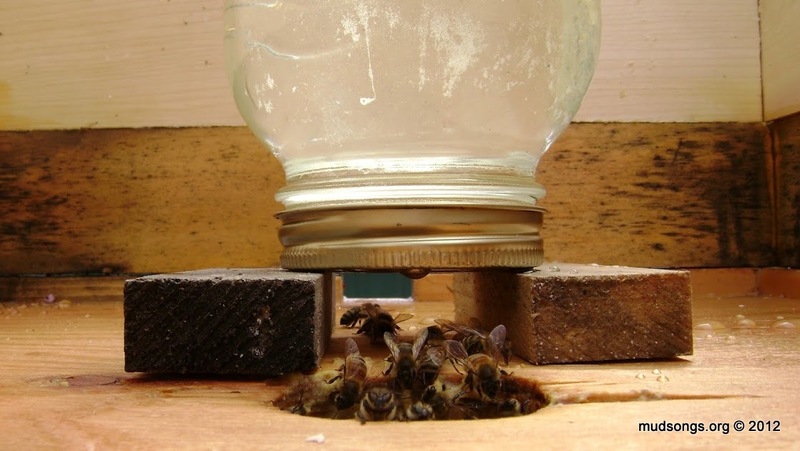 If they already have an established hive space, removing the inner cover (and installing a jar feeder) gives them more space and they’ll naturally want to fill it up, just as they do when a honey super full of frames is placed on top. However, the inner cover directly over the top bars (or the frames) will usually prevent that. The bees will perceive everything beyond the inner cover as being outside the hive body and won’t be compelled to build comb there — unless they absolutely have nowhere else to go. But my bees have plenty of empty drawn comb beneath the inner cover and are not likely to abandon all that great real estate and spend a huge amount of resources building brand new comb outside the established hive space. I’m curious what you’re referring to as to my entrance. Do you not have an upper entrance? The inner cover is in the “summer” position so the bees have go through the inner cover hole to exit the hive through the upper entrance. Yeah, I’m not sure what you mean. Hi again, Charlie — I think I get what you’re talking about now. I think you’re saying you put the jar feeder directly over the inner cover hole but you’ve kept the inner cover in the winter position. Yeah, I can see how that would work. The bees wouldn’t have to leave the hive body to access the syrup. They’d barely have to break cluster. The syrup would be directly over the brood nest and could leak with fluctuating temperatures. Still, as long as it’s not a steady leak, a healthy cluster can handle that. I can see the advantage of that set up. I suppose the advantage of my set up, with the inner cover in the summer position, is that the bees have to leave through the inner cover hole to exit the hive (at least on top), and with a jar feeder between the entrance and the inner cover hole, they’ll immediately discover the syrup and go for it. They can’t miss it. I’ve seen bees completely ignore syrup inside the hive in frame feeders but go for it closer to the brood nest with a jar feeder. The same with hive top feeders. At this time of year, when the weather is still pretty damn cold, the bees seem not to want to travel far from the brood nest — and the jar feeder brings the syrup closer than any other method.